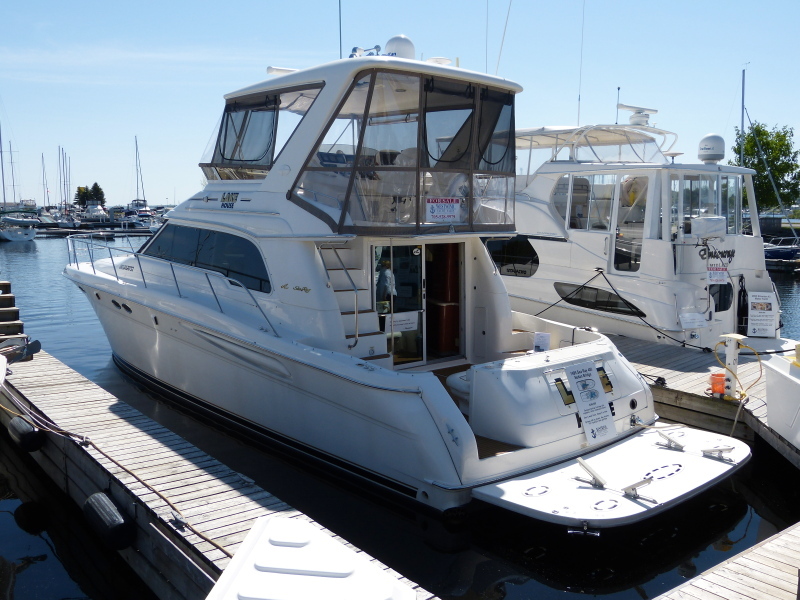 The 480 Sedan Bridge was the largest of the Sea Ray Sport Yachts 1998 – 2004, well suited for extended cruising with friends or family, and a more than capable off-shore cruiser. With three staterooms forward (2 with island beds and ensuite heads) and an electrically operated convertible salon sofa, 6-7 can be accommodated in comfort.. Underway, captain and mate enjoy the comfort and safety of bolster-equipped pedestal chairs under the command bridge hardtop. A wraparound lounge forward of the helm provides comfortable passenger seating, with easy access to chilled refreshments for all. Access to the forward deck sunpad area is provided by wide sidewalks lined with a solid stainless steel railing system. The helm itself is well instrumented with key controls placed easily within reach. Open array radar, autopilot, chartplotter and many other navigation aids are all within easy reach. A full canvas bridge and cockpit enclosure completes the picture with reverse air/heat providing optimal comfort. The main salon/galley is a work of art with highly finished cherry wood cabinets and paneling throughout, recessed lighting, and neutral coloured upholstery that can easily fit with a wide variety of colour schemes. There is a large flatpanel TV opposite an L-shaped settee that converts to double berth at the push of button. The salon and galley floors are easily-maintained hardwood in like-new condition. The galley is bathed in warm, natural lighting and fitted with every conceivable convenience, including a three-burner electric stove, microwave, coffeemaker and side-by-side refrigerator/freezer. Counter tops are a light colored faux-granite with integral sea rails. Stepping down and forward, a companionway leads to three well appointed staterooms. The master has a full-size pedestal bed and a private head with a separate shower. There is a cedar-lined hanging closet and a built in TV/DVD entertainment system. The portside stateroom also has a full-size berth, a built in TV/DVD and ensuite access to the second head. Both master and portside staterooms have their own individual climate controls. The starboard stateroom features twin bunks, a hanging locker and a concealed washer/dryer. Other major features noted: a remotely controlled hydraulic swim platform for dinghy management, a bow thruster, upgraded 50 amp electrical service.